If you need to hide a series of optgroups with Jquery, it is easy to do so in Firefox: you just need to call $(this).hide() on the option group, and it and all its children will be hidden and not selectable. If you want to show them back, you just need to call $(this).show() and they will reappear. However, other browser like Chrome and IE don’t allow this: the style rule (display:none) is applied to the element but does not work, and the elements stay visible. I’ve found out a quick workaround for this problem. move the optgroup to the beginning of the select’soptgroups, so that it is visibile again. hide/show the element in Firefox directly. then, it disables/enables all of the optgroup’s options. and moves it to the end/beginning of the select’s optgroups. scrolls the select to the top, so that the first optgroup is shown even if the user had scrolled down and selected something else (only for the show function). This has been tested with Chrome, will test it with Explorer soon. Hope this helps. Comments and suggestions are welcome. Thanks for your script, it’s nearly perfect for me. The only problem i see is that the reminding option stay visible in chrome even if they are disabled. How to hide them and clean the select? The only option to really hide them is to remove all options, save them somewhere, wipe the select options and repopulate the select only with the options you want. It is a much more complicated thing to do, I went for the simpler option. You can also do .css(‘visibility’,’hidden’) but the scroll bar will probably remain. Here you can see a selection of the websites we've created in the past few years. Article Marketing - Publish your articles for free! Press Releases - Publish your press releases for free! 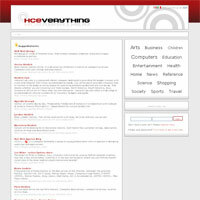 Web directory for indexing web sites divided by category and open to contributions from users, developed by HCE Web Design. A fortnightly web strip about Information Technology. Follow HCE Web Agency on Twitter! Find your cheap hostel in Venice with Hostelsclub.com. Find 127 Venice hostels, hotels and other types of cheap accommodation, rated by 9683 users who have actually gone there.